Japa 355 - The compact Japa 355 is a machine for every need. The in-feeding and cutting of the logs is easy to operate by on simple saw handle. The cutting of the wood is taking care of hydraulic chainsaw. 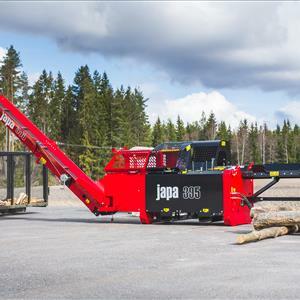 Using 15” bar Japa 355 enables the cutting of logs diameter up to 35 cm. The length of the cut can be adjusted up to 60 cm and the 2/4-way or optional 6-way knife ensures also the wood production from bigger logs. The Hydraulic driven 3.8 m conveyor loads the logs straight to the trailer or sack. completely covered to ensure optimum safety. Easy access to timber from one piece guard which opens fully.